This morning I completed the last of the Coaxial Shear Injector particle sizing experiments. I now have a sizable and interesting data set that is going to take no small amount of processing. With that in mind, this post will be a combination of a description of the experiments carried out and the photographic method adopted. I will also give some initial speculative conclusions based on the results as analysed thus far. These set ups were all run with air and then argon to test the effect of varying momentum flux ratio and aerodynamic Weber number, as well as velocity ratio. The liquid simulant was water. The 2.5mm orifice gave a liquid velocity of 5.6 m/s (18.4 ft/sec) whereas the 3.5mm orifice gave 2.86 m/s (9.4 ft/sec). Another subset of experiments was run with the 2Dl recess using air with a swirl inducer in the central orifice. Both water and air were run through the central orifice to check the effect of the swirl. In addition, air was also run through the central orifice without swirl. The gas/liquid ratio was the same as the design o/f ratio, namely 1.2. This meant that the water flow rate was increased fractionally when running the argon tests in order to maintain some degree of verisimilitude. The injector was mounted on a simple bracket which was then held in a machine vice. As can be seen, the break up length is visible but little else. I experimented with various techniques and I found that the best spray and droplet images were produced by directing the flash onto the spray from the front, using the perspex screen as an opaque background. It can be seen that the spray appears to consist of two discrete cones; a relatively translucent outer cone with an optically more dense core. This core consisted of a variety of sizes of droplet ranging from about 160 microns to 600 microns. 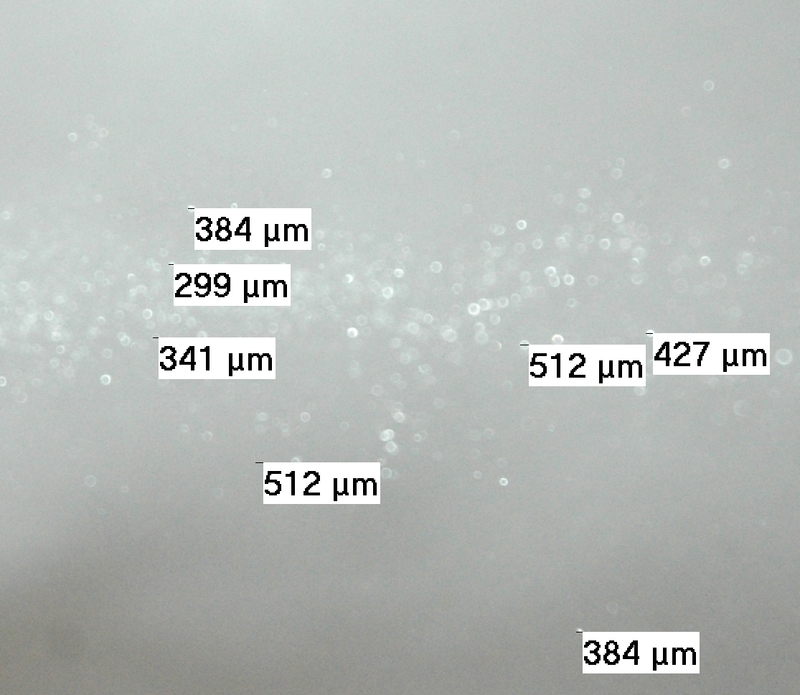 The major droplet clusters appear to be around the 250 - 300 micron size. The droplets in the outer cone could not be resolved with the camera and lenses at my disposal. They form the vast majority of the droplets in the spray, and I believe that they are very small indeed, certainly 60 microns and smaller. Hence conclusions on spray quality can only be made based on the droplets that can be resolved. Some tenuous preliminary conclusions? 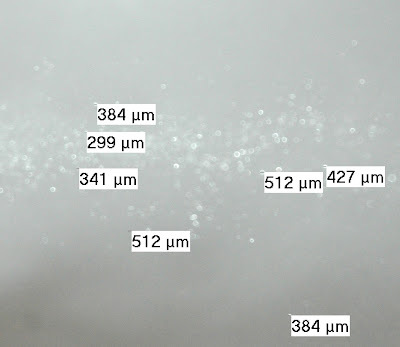 Resolved droplet sizes ranged from 160 to 600 microns. There appeared to be a considerable number of smaller droplets that could not be resolved. Increasing momentum flux ratio appears to produce overall smaller droplets. Decreasing velocity ratio seems to produce coarser atomisation, with a faster liquid speed creating smaller droplets. This points to the liquid Reynolds number creating more and smaller initial disturbances. Oscillation or pulsing of the spray was observed in all the basic injector configurations, to a greater or lesser degree. Increasing Dl tends to increase the severity of the pulsing (amplitude increases whilst frequency seems to remain stable). I suspect the pulsing is driven by some sort of recirculation at the point of the gas/water interface, and recessing the centre post makes this worse. The initial results seem to be confirming those predicted from study of shear coaxial injector theory, as well as those from the earlier tests carried out in 2010 - 2011. I know that you will all want to see a picture of the spray showing droplet sizes. so I've included one below. I have to stress at this point that I am still processing the images from the experiments and another post will follow detailing the droplet distributions and average sizes for each configuration, along with more detailed conclusions. I will also describe the droplet sizing software used. This image is a slice from the Position 1 shot taken from a run using the 3.5mm orifice with air and a 1Dl recess. To reiterate, I've compiled this post to get some initial results "out there" and a description of the experimental method. A more detailed one will follow giving droplet sizes and distributions for all of the configurations tested, along with more in depth conclusions regarding the various injector configurations. I hope to have the detailed post ready in the next few weeks. Do keep watching. That droplet sizing software sounds really interesting - did you write it, or is it something I might be able to find somewhere on the web? 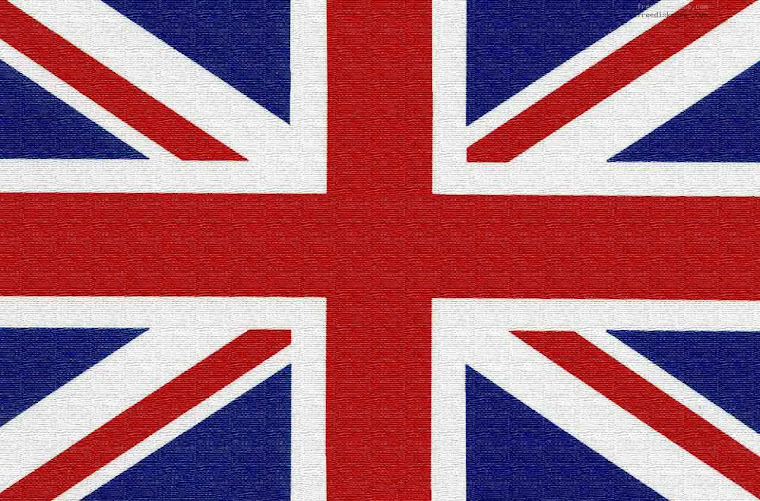 Best Wishes, British Reaction Research.